Outside of the Amazon, the rainforests of central Africa are the largest in the world. They contain huge amounts of carbon and wildlife—two items at the top of the list for those looking to protect the planet's health. The Democratic Republic of the Congo is home to 60 percent of those rainforests. Today UCLA's Institute of the Environment and Sustainability, the World Wide Fund for Nature, or WWF, and the Congolese government published a report and carbon density map that shows the entire country's forests in greater detail than ever before, empowering global efforts to protect them. The map was created using methodology developed by Adjunct Professor Sassan Saatchi, an expert on tropical forests and the global carbon cycle with UCLA and NASA's Jet Propulsion Laboratory. It combines data from satellites and an airplane-based laser detection system known as LiDAR, or light detection and ranging, to map the height and crown of trees at a fine-scale resolution. The report also includes information about how carbon distribution correlates with topography, soil type and rainfall. "It gives us a picture of how the land looks, the structure of the landscape, vegetation types and how it all changes over time," Saatchi said. Accurately measuring the rainforest is an important part of a conservation strategy countries are increasingly turning to since the Kyoto Protocol, which was formally adopted at the Conference of Parties in Kyoto in 1997. The strategy, Reducing Emissions from Deforestation and Forest Degradation in Developing Countries—or REDD+, for short—places a cash value on the carbon that is contained and kept from being released in each hectare (10,000 square meters) of forest. The price can range from $20 to $50 per hectare, Saatchi said. "It becomes a huge asset for countries that have millions and millions of hectares of forest," Saatchi said. "Each hectare has almost 100 to 200 tons of carbon. If you multiply the numbers, it becomes billions of dollars. It has developed a completely new economy in the world." 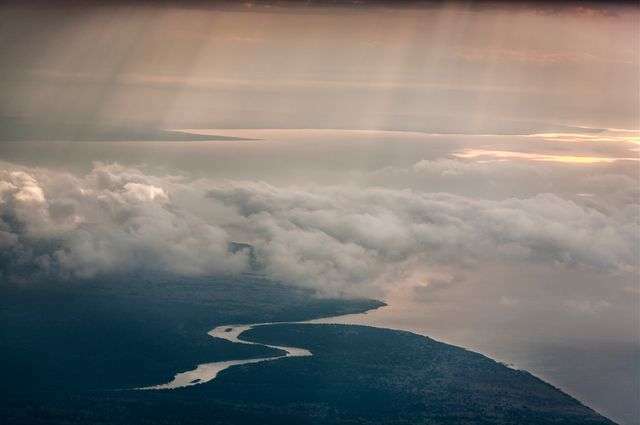 Accurate measurements and pricing of carbon enable organizations like the World Bank, USAID and the German KFW Development Bank to offer a financial incentive to rainforest-rich countries like the Congo to conserve. The result is keeping potential carbon emissions firmly in the ground and protecting the dense, carbon dioxide-consuming vegetation. But getting that clear picture required a massive, collaborative effort. The project took over four years and cost around $8 million, funded by the International Climate Initiative, or IKI, of the German Federal Ministry for the Environment, Nature Conservation, Building and Nuclear Safety, or BMUB. Southern Mapping Company was contracted to handle airplane-based data collection. 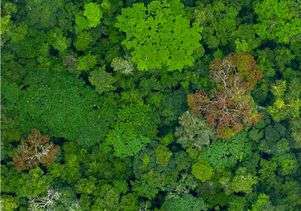 Using single- and twin-engine aircraft, its crews crisscrossed the Congo basin, covering more than 40,000 miles, collecting 20 billion points of LiDAR data and taking more than 43,000 photographs, said CEO Norman Banks. About 650,000 hectares of land was scanned in fine detail. Saatchi extrapolated the data and calibrated it with detailed field information from forest inventory plots established by WWF in the Democratic Republic of Congo and local organizations to map 150 million hectares of Congolese jungle. While the sample represents a small percentage of the whole, it is significantly larger than what is usually collected. Traditional methods of assessing carbon density rely on foresters to measure tree diameter and identify species by hand—a practical impossibility in places like the Congo, which lack the necessary infrastructure and workforce. From air and space, a much larger area was sampled, with measurements made of tree height and crown size. This enabled researchers to calculate the mass of the forest, which directly correlates to how much carbon it holds. The samples collected also provide an extremely clear picture of certain locations. "We have detailed measurements that can tell us if a single tree falls or a little shack is built in the middle of the forest," Saatchi said. "We captured that around the whole country." Saatchi pitched his new method after a successful test run that was funded by USAID in a remote and unstable part of Colombia. Scanning all of the Congo was a much larger undertaking, requiring serious investment. With the method proven, the German government stepped up. As countries around the world are now working to reduce carbon emissions, energized by the Paris agreement, the investment appears to have paid off—and the results were made public so anyone can use them. Aurélie Shapiro, a remote sensing specialist with World Wide Fund for Nature Germany, said the goals go beyond REDD+ projects—the map will inform land-use planning and development that protects the most sensitive and important parts of the rainforest. The map is also a living document that can be updated, enabling deforestation, reforestation and the effects of development to be tracked over time. Although World Wide Fund for Nature's goals have evolved from saving species and wilderness to addressing larger global threats, protecting the forests automatically protects the species that live in them: mountain gorillas, critically endangered okapi (an herbivore related to the giraffe), and the bonobo, the most similar ape to humans. Based on gross domestic product per capita, the Democratic Republic of the Congo ranks among the poorest nations in the world. But "in terms of natural resources, it's definitely the richest," Shapiro said. Some towns and villages outside of the capital city of Kinshasa lack access to infrastructure, particularly electricity, so residents deforest large areas of rainforest to produce charcoal for cooking. Now, they'll have other options. Similar projects have already handed out payments for sustainable farming and planting fruit or fast-growing trees for charcoal production, Shapiro said. "Setting up this REDD+ program enables people to eventually get compensation to protect forest. It can be enough money to provide them with alternative livelihoods." Aside from environmental benefits, the vast data uncovered is fertile ground for research, Saatchi said. His research team is only scratching the surface, but they've already made a few surprising discoveries. Parts of the forest are richer in carbon than originally thought. The trees are taller, too, some exceeding 230 feet in height. Researchers plan to study whether variables such as soil type, rainfall and topography affect carbon density, potentially leading to even more precise conservation methods in the future.